Above: The Boeing Philadelphia subsonic wind tunnel is the largest privately owned wind tunnel in the United States. The nine-blade fan (shown here), measuring 40 feet (12 meters) in diameter, can generate up to 15,000 horsepower and speeds greater than 220 knots. Since opening in 1968, the facility has logged nearly 70,000 test hours. The best prizefighters know how to take a punch and keep on fighting. Their desire to win won't let them quit; they have tremendous heart, courage and pride. They are skillful, able to beat opponents with their brains, not their biceps. And they are agile, anticipating and responding instantly to their opponents' moves. Much like Rocky Balboa, the iconic, fictional boxing hero eternally linked with the City of Brotherly Love by the movie "Rocky," Boeing Rotorcraft Systems in Philadelphia has defeated adversity on numerous occasions, battling back from a potential knockout to become one of the company's most profitable sites. The Philadelphia site can trace its roots to 1940 when rotorcraft pioneers Frank Piasecki and Harold Venzi founded the P-V Engineering Forum in nearby Roxborough, Pa. Three years later, with Piasecki at the controls, the company celebrated the first flight of the single-seat PV-2. Although the historic flight lasted just 10 minutes, it helped pave the way for decades of military helicopter research, development, design and operational use. By 1944, the U.S. Navy had recognized the helicopter's potential and awarded Piasecki's team a contract for the development of a tandem-rotor design. A year later, the company completed and flew the XHRP-X, the first American helicopter to feature the counter-rotating tandem-rotor configuration used today on Boeing CH-47 Chinooks and CH-46 Sea Knights. With a new name, Piasecki Helicopter Corporation opened a new manufacturing plant in Morton, Pa., in 1947. After Piasecki's departure in 1953 the company changed its name to Vertol Aircraft Corporation. Before Boeing acquired the company in 1960, Vertol, later renamed Boeing Vertol, developed two of its most successful designs: the 107, a tandem-rotor commercial transport helicopter from which the CH-46 Sea Knight was developed, and the YHC-1B, the prototype for the CH-47 Chinook. 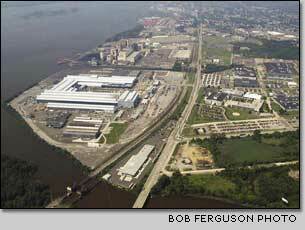 In 1962, Boeing Vertol moved its facilities to the Philadelphia site's current location, once occupied by a locomotive manufacturer, along the west bank of the Delaware River. The 1960s also saw the first flight and delivery of the CH-47A Chinook and the development of the CH-46A and UH-46A Sea Knight for the U.S. Marine Corps and U.S. Navy, respectively. Rotorcraft production peaked during the Vietnam War, when 14,000 employees working three shifts cranked out a Chinook or Sea Knight each day. Thanks to numerous modification contracts and customer support efforts, many of these aircraft are still used today by armed forces around the world. To help keep the business on track during slow times after the Vietnam War, the site produced mass-transit railcars through the early 1980s. The site also delivered undercarriages, produced under contract by Japan's Kawasaki Heavy Industries, for Southeastern Pennsylvania Transportation Authority trolley cars. In 1979, Boeing Vertol rolled out and flew the CH-47D Chinook for the first time. Two years later, the U.S. Army established the first production contract to modernize its Chinook fleet to the CH-47D configuration. The tiltrotor era began in the mid-1980s, when the U.S. Navy awarded the Bell-Boeing partnership a full-scale development contract. The first V-22 Osprey rolled out in 1988, flew in 1989, and accomplished its first full conversion from helicopter to airplane mode later that year. The Bell Boeing V-22 Osprey is a tiltrotor aircraft, capable of taking off and landing like a helicopter. Once airborne, it can rotate its engine nacelles forward, converting to a turboprop airplane capable of high-speed, high-altitude flight. Ninety-seven percent of Boeing Philadelphia's 1,300 union-represented employees currently participate on Employee Involvement teams. Of the 122 factory teams, 32 have reached Stage 4, the final stage, of the team maturity scale. During the final stage, the teams engage in strategic planning, advanced problem solving, financial management and organizational development. During the 1980s, after several companywide reorganizations, Boeing Vertol became Boeing Helicopters Company, Boeing Helicopters Division, and finally, Boeing Defense & Space Group, Helicopters Division. Although the name changed, the company continued to perform, teaming with Sikorsky in 1991 to win the developmental competition for the U.S. Army's new armed reconnaissance helicopter, designated the RAH-66 Comanche. 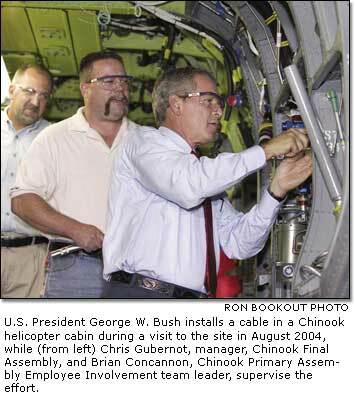 Boeing also began production of the MH-47E Special Operations Chinook, delivering the first of 11 aircraft in 1993. 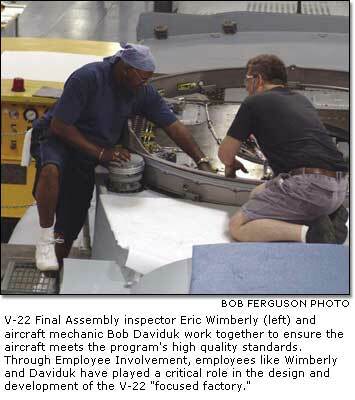 1995 featured the rollout of the Comanche as well as the delivery of the first production V-22 fuselage. A year later, the Comanche conducted its first flight. After completion of the merger with McDonnell Douglas in 1997, the division was renamed The Boeing Company in Philadelphia, and later Boeing Rotorcraft Systems in Philadelphia with the formation of Boeing Integrated Defense Systems in 2002. In addition to continued aircraft development and production, the turn of the century also brought with it one of the darkest periods in the organization's 65-year history. 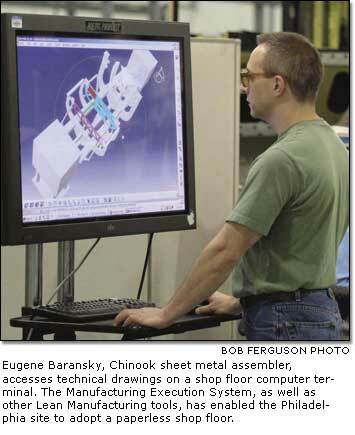 A 10-foot-wide banner that reads, "Lean today, here tomorrow" greets employees on the Chinook factory floor each day. It's more than just a catch phrase, a reminder of tough times or a hint of the site's potential. It's become a way of life for the Philadelphia site and its 4,600 employees. 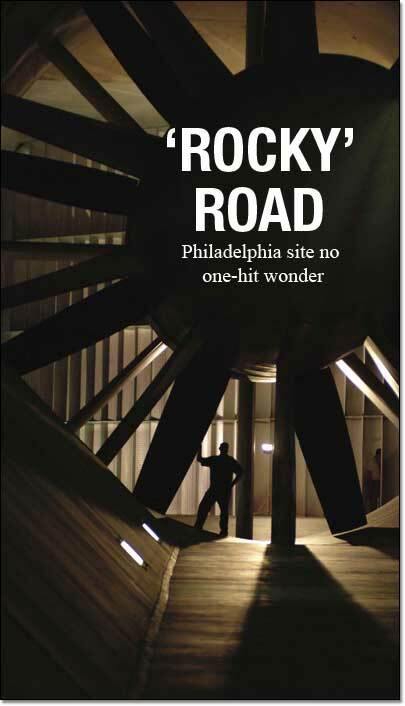 In 1999, the Philadelphia site was in trouble. Big trouble. The U.S. Army and Marine Corps, its largest customers, were not pleased with the products or the prices. A year later, facing rocketing product costs, poor quality and a grim future, the site embarked on a transformation to improve its business performance, streamline its processes, increase employee satisfaction and repair its tarnished reputation. A transformation of this magnitude isn't easy, so the site sought help from long-time, reliable friends—its employees. "Our transformation started with employees asking themselves, 'How can I improve my work, and what can I do to help the site and my teammates succeed?'" said Dan Meyer, Philadelphia site manager and director of operations. "From there, we engaged all employees to help identify and eliminate the barriers that had prevented us from succeeding." Meyer said Employee Involvement and the adoption of Lean manufacturing and engineering philosophies and tools have been directly responsible for the site's turnaround. "Lean and EI have been a great one-two punch for us," he said. "Because of the progress we've made in these areas, we've managed to survive some really tough times, from possible closure in 2000 to setbacks in the development of the V-22 Osprey and the outright cancellation of the RAH-66 Comanche program. Our employees routinely roll up their sleeves, take ownership of the problems and work together to resolve them." Meyer acknowledged that transforming a struggling business into a financial asset is a very painful process. "You have to take a long, honest look at what you're doing today to plan for and meet the customer's challenges of tomorrow," he said. "If you're going to change a culture, as we did, you must change it from top to bottom and from left to right. Prior to the transformation, we simply couldn't meet our cost targets. Since then, we've had 17 consecutive quarters of financial improvement." Over the past three years, Boeing and the U.S. government have made significant investments to help transform the Philadelphia site. With these investments, Boeing has reduced the price of a U.S. Army CH-47F Chinook helicopter by 30 percent, from $42 million to $30 million. Also, during the same period, the V-22 Program has completed a number of cost-reduction initiatives to stay on track for a $58 million-per-aircraft cost target by fiscal year 2010. As a result of the transformation and subsequent investments, the Philadelphia site now boasts state-of-the-art focused factories, drastically reduced defect rates, improved customer and employee satisfaction, and some of the best financial results in the company. "It's clear to everyone at the Philadelphia site and in the company that we're making the necessary changes to compete," Meyer said. "There's no better compliment than having someone visit the site to learn from our mistakes to make improvements of their own." The site's transformation has become a source of pride for the employees who made it happen. "As an EI team, we're able to make decisions that impact the bottom line," said Andy Gallo, Chinook lead sheet metal mechanic and an EI team leader. "People with positive attitudes make positive things happen." Although the site has seen tremendous improvements, Meyer admits that the transformation is far from complete. "If we want to continue being successful, we can never stop transforming," he said. "Our customers' needs are changing, and our competitors are becoming more capable every day. We must continue working toward common processes and systems, while providing the best solutions for our customer—the warfighter." The work atmosphere at the Philadelphia site focuses on teams and teamwork taking precedence over individual gains. And although employees take great pride in the site's unique history and recent progress, they are more interested in where they're going than where they've been. The V-22 Osprey is poised for a full-rate-production decision later this year, increasing production from 11 aircraft per year to as many as 48 at peak production. Customer confidence is high, with the U.S. Marine Corps Initial Operational Capability scheduled for 2007. The Chinook program has never been stronger. The current CH-47F modernization program—more than 500 aircraft—will keep the cargo helicopter in military service through at least 2030. Manufacturing advancements, including a completely redesigned fuselage, will open up new U.S. and international sales opportunities. "I'm extremely impressed with everything I've seen here—your dedication to quality, your dedication to the troops in the field and your dedication to delivering the right tools to fight the global war against terrorism," said U.S. Army Gen. Doug Brown, commander, U.S. Special Operations Command, during a recent visit to the site. "It's a real honor to be here with such a completely impressive organization." While production employees are hard at work delivering the aircraft customers need today, others are working with the region's best minds on the network-enabled systems of tomorrow, including significant work on Future Combat Systems, unmanned vehicles and alternative vertical lift solutions. With new facilities such as the Modeling, Simulation and Analysis Center, [LINK TO: IDS story "Center stage"] the site can infuse network-centric capabilities into platforms that were originally designed before many of today's employees were born. The site's long-term strategic plan focuses on executing the business; enhancing capabilities; optimizing infrastructure including the facilities and computing systems that drive the business; and utilizing employees' diverse talents and experiences to generate cost-effective, high-quality solutions. With a sound strategy for the future and vivid memories of the past, the Philadelphia site is poised for a title run. "This site has proved time and again that it's never down for the count," Meyer said. "We're ready for whatever the next round holds for us."